For centuries this oil has helped us harness the power of our own connection on a emotional, spiritual and mental level! And now it can harness the power of our wellness* and support our body's vitality when taken internally*. Just add 1–2 drops to a vegetarian gel capsule and take daily. Or if you want to explore, add it to your favorite drink, smoothie or recipe. My favorite is adding it to a shot of NingXia Red Wolfberry Juice! As I do receive new information and testimonials for Frankincense Vitality Oil, they will be added to this page. So check back frequently or subscribe to the Oil Blog so you don’t miss a thing! Want to Purchase Therapeutic Frankincense Vitality Essential Oil? Go to the Oil Shop! 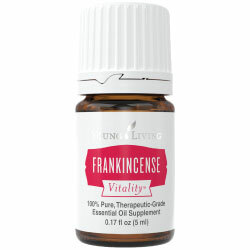 Buy Frankincense Vitality Oil Here! Also not all frankincense is approved for "internal use" or use as a nutritional dietary supplement. What Does this Number Mean? ORAC stands for Oxygen Radical Absorbance Capacity. It tells you the antioxidant capacity of a food item.This was developed by the USDA researchers. For instance: Oranges = 750; Clove = 1,078,700. Wow! The number for clove is NOT a typo! What are the Plants Properties? Calming and centering. What are the Documented Uses and Benefits of Frankincense Vitality Essential Oil? Supports well-being and normal cellular health when taken internally*. Want to Learn about Frankincense's Emotional, Spiritual and Other Uses? Then go to the Frankincense page. Or learn about Boswellia sacra or Sacred Frankincense. What are the Safety Precautions? Only therapeutic grade essential oils Approved as a Food Additive (FA) and Flavoring Agent (FL) by the FDA. Although it may be used as a dietary supplement, it is advised not to use it in this manner for children under 6 years of age. Keep out of reach of children. Do you HATE swallowing capsules? No worries! Take Frankincense Vitality internally by adding it to juice, water, or even a shot of NingXia Red® and don't miss a beat! Wahoo!